No, it isn't a subcompact, but it is one of the smallest minivans available (and I'm a big fan): The Mazda5. 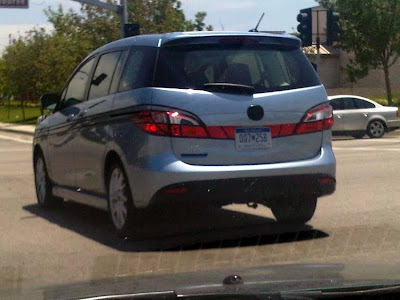 Subcompact Culture reader and contributor, Sean Murphy, spotted the not-yet-released 2011 Mazda5 around Irvine, CA. ... the front, however, now wears the Mazda corporate happy face, which seems to be a love-it-or-leave-it look. 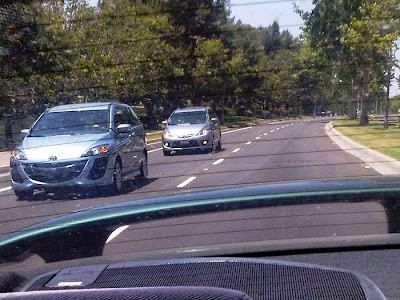 I don't mind it on the upcoming Mazda2, but am not a fan of it on the Mazda3, Mazda6, or here (at least in pictures). Maybe it looks better in person. Also, you can make out the several swoops in the bodylines on the sides. Yes, those are apparently imprinted in the metal, not graphics. Good reflexes, Sean, and thanks for the pics! Mazda designs are going downhill FAST. I am on the love it side of things when it comes to the happy face of Mazda's cars. 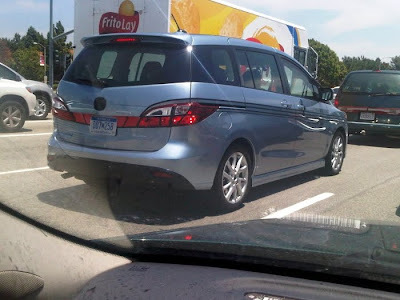 I think the new Mazda5 looks more aggressive and has more personality than the previous generation. Sorry about the dirty windows and grainy pics; my Blackberry has an OK camera and I have not been keeping up on car care since I lost the SX4 to the fire. Wow.... did someone leave it behind at a bar?